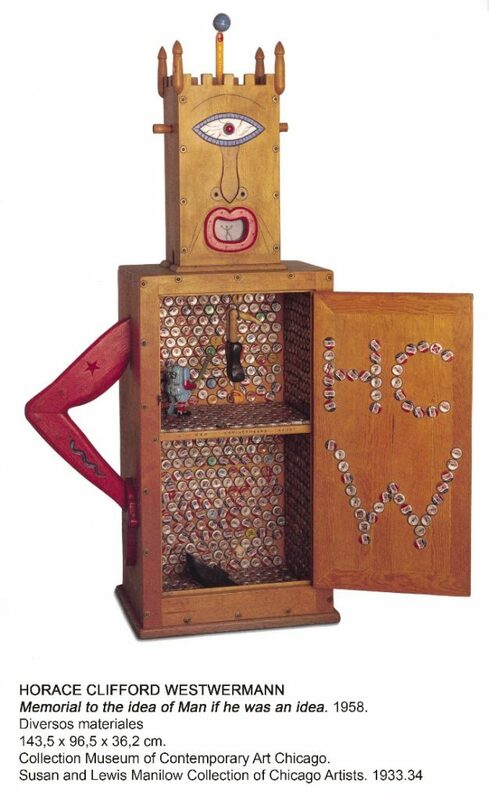 February 5, 2019 – May 6,2019 H.C. Westermann: Goin’ Home, the first retrospective in Spain of the American artist Horace Clifford Westermann (Los Angeles, 1922 – Danbury, Connecticut, United States, 1981), will present some 130 works dated between 1954 and 1981: mainly sculptures, but also lithographs and wood engravings, drawings, letters and paintings from his first artistic stage. H.C. Westermann has been considered an artist difficult to place in the tendencies of his time. However, his works participated in different debates of the moment, in particular, within proposals that were understood as forms of realism. In the early 1960s, Westermann emphasized his use of science fiction and mass consumption images. This earned him a place in exhibitions of incipient Pop art. Later, he increased his reflections on death and his concern for the environment. Westermann assembled a distinctive and singular body of sculptures. His works were predominantly made from wood through his masterly command of carpentry and cabinetmaking, yet he also used other techniques and materials such as metal, glass and enamelling with incredible precision. Without adhering to one particular style, Westermann was a maker of objects, of separate pieces: his sculptures, laden with meaning, often irony, result from the processing of experience, coalescing to yield specific fragments of reality. It is the course of these fragments that the retrospective presented by the Museo Reina Sofía follows. A concern with going back to shelter would soon emerge, be it in the home or the body —and blighted by the threat of confinement and death. Also, stubborn or helpless figures would recur through Westermann’s oeuvre. The motif of the “death ship” runs right through the breadth of his production as well, pointing, on one side, to continued wandering and latent abandonment and, on the other, to a determined pursue of refuge which seems to hold firm across his work. At the turning point of the 1960s, Westermann’s sculptures drew from mass culture, and made part of several exhibitions of the new realisms, when the “cold” tag of Pop art had not yet fully taken shape. The exhibition presents this output and the “specificity” of Westermann’s objects, which interested Donald Judd in 1963. In later pieces his work increasingly deals with the absurd, either through playfulness with language, in the confusion between work and instrument, or with references to the impermanent. Besides the sculptures, the show displays Westermann’s paintings, letter-drawings —in his correspondence with other artists, critics and friends— and series of prints, in which he applied vibrant colours to address themes such as an escapist, while critical depiction of the American scene; catastrophe, and fragility. A graduate from the School of the Art Institute of Chicago in 1954, Horace Clifford Westermann produced most of his work from a small town in Connecticut, where he settled in 1961. He regularly exhibited his work in New York, and occasionally in Chicago and on the West Coast.